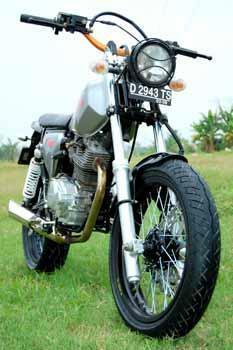 this is GL-MAX modificatian art for trail motorbike. Track understandable in the community, all of the loot is not only characterized by the Jap's Style but thick shades aka scrambler bike trail. 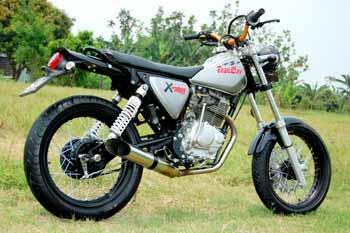 "The owner Aziz Rahman hooked grasstrack and adventure. This bike used to be "tortured" in the way of frizzy, but now have another motor would be built and more eye cathing, "go to Muhammad 'Barbie' Subhan, the builder. old mode indeed subtle nuances of this motor. Matters such as design rather rigid tank owned by TW 200 old type have sustained front pretentious XL-R made at 1972. Then, back, owner need to change again part of the rear chassis. for usual, she cut off a little until the memorable meetings and regular use stirrup as motor have done for adherents understand Jap's Style. XL input devices present again in the arm swing. "The reason is obvious, make it more classic tubular appearance. Again also a longer swing arm to be better ergonomics, "said the builder. Its usefulness is clear, this time the community was hooked Track turing. Save them, all the spoil of the modification must ridiable and ergonomics that fit. There is something special about their loot. Harmonization between the components, the choice of color and detail categorized neatly.